If they are unable to answer your questions they will be able to give you the correct information. 1. All gate collections must be for a Committee fundraiser or for a UAW 1268 member or their spouse or child. 2. Any member who wishes to request a gate collection, for themselves or others, must fill out a request form (available at the hall) and must make a motion at the monthly membership meeting under “New Business”. If in the event there is a cancellation of said meeting (summer months etc.) then the Executive Board may make a decision. 3. DATES MUST BE PRE-APPROVEDTO PREVENT MULTIPLE COLLECTIONS. 4.You must make your own leaflets stating the purpose of the gate collection. Leaflets must state pertinent information and after collection a Thank You with the amount collected must be made available to the membership. 5. Leaflets MUST be approved by one of the top 5 officers of the Local Union in advance. Copies can be made at the Local Union Hall. 6. You are responsible for finding your own volunteers to man the gates at ALL units NO LOST TIME OR UNION BUSINESS WILL BE GIVEN. (exception to include committee collections and late arrivals to complete responsibilities associated with collection). 7. You must pick up and return all of the collection boxes from/to the Local Union Hall during office hours (between shifts if applicable). DO NOT OPEN BOXES. 8. All monies will be counted at the UAW Local 1268 Union Hall. Counts are considered as being accurate, but in many instances they are not. Verification of the count or non-verification of the count will be determined by the count of the Alpine Bank upon the deposit of the collection. A receipt will then be issued for the exact amount and a check cut subsequent to deposit. This would normally be the Wednesday following the collection on our regular payable day. 9. Unless special circumstances ONLY TWO GATE COLLECTIONS PER MONTH WILL BE ALLOWED. ***If you have further questions, please feel free to call the Local Hall at 815.544.2111 between the hours of 8am-5:30pm. How do I get paid for Jury Duty? Weingarten rights guarantee an employee the right to Union representation during an investigatory interview if they have a reasonable belief that the investigatory interview will result in disciplinary action. These rights, established by the Supreme Court, in 1975 in the case of J'. Weingarten Inc must be claimed by the employee. The supervisor has no obligation to inform an employee that s/he is entitled to Union representation. · The case is based on an employee who worked at a food outlet operated by J. Weingarten, Inc. She was summoned to an interview with supervisors and questioned about failing to pay full price for a box of chicken. The employee, a member of the Retail Clerks Union, asked for a union representative several times, but her request was refused by the manager each time. The employee reported what had happened to her shop steward and other union representatives. As a result of her being denied a union representative, an unfair labor practice charge was filed with the National Labor Relations Board, and the ruling in favor of the employee was appealed numerous times until it went before the high court. If you are brought in for questioning a suggested standard statement is: "If this discussion could in any way lead to my being disciplined or discharged, I request that my Union Representative be present at the meeting. Without representation, I choose not to answer any questions." Give the employee a Choice of: 1. having the interview without representation or 2. ending the interview. Do Weingarten rights apply automatically? –No, the supervisor is not required to inform the employee of his/her rights.The employee must request representation when they reasonably believe it will result in discipline AND when a valid request for a representative is made (you need both). Nor must the employee repeat a request for representation. Where an employee has been advised that disciplinary action will not be taken, Weingarten rights will not apply. Can Weingarten rights be waived? –Yes, but an employee’s waiver of Weingarten rights must be made knowingly and voluntarily, and it must be clear and unmistakable. Is it a violation to discipline an employee for invoking his/her Weingarten rights? –Yes, it is a violation of the National Labor Relations Act to discipline an employee for invoking his/her Weingarten rights. Similarly, it is a violation for an employer to discipline an employee for refusing to waive his/her Weingarten rights. Who can be your rep.? –An employee has the right to have a union representative. If the chosen union representative is not available, the employee must be provided an alternative representative if requested. May the representative participate in the interview? –Yes. Union Reps. have active roles to play. They may speak privately with the member before the interview, must be advised of the interview subject matter by management, request that the supervisor clarify questions, give advice and counsel the employee on how to answer the questions, and provide additional information to the supervisor at the end of the questioning. The Union Representative does not have the right to tell the employee not to answer nor, obviously, to give false answers. Take notes– All reps. should take detailed notes, recording everything that is said, by whom, and any intimidation or other unlawful tactics. Unfortunately, the Supreme Court did not require employers to tell workers about their right to union assistance, as it did in the Miranda decision covering police interrogations. 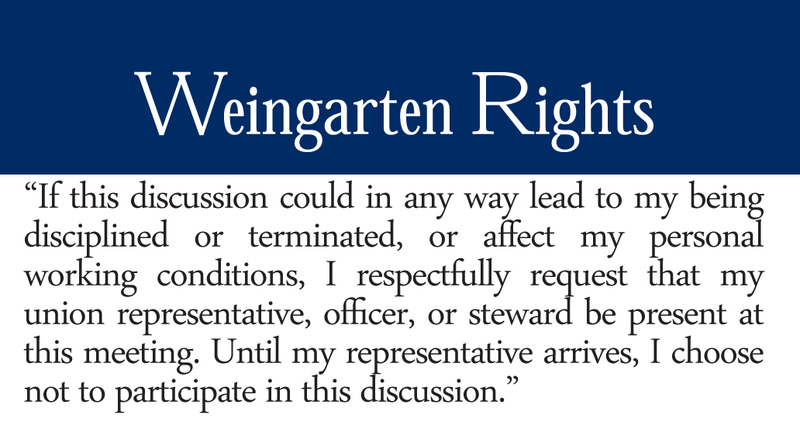 The union must educate members about their Weingarten rights BEFORE an occasion to use them arises. *Laws are subject to change this is an informational post only, it is not legal advice.